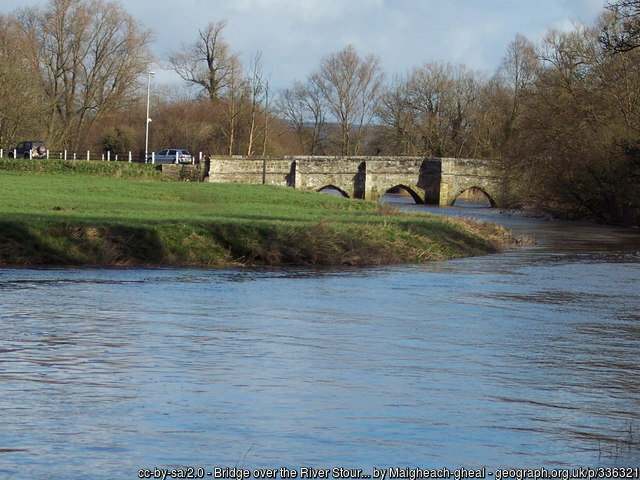 The town’s name reflects two features of the town: the River Stour, and the Minster. The town, which dates from before the Domesday Book, grew as a market for local agricultural products, especially dairy products. Henry III granted the town a charter for a market in 1219. The market, which closed in 1998 was once the largest livestock market in Britain. The C15th market cross marks the 800 year old market place. 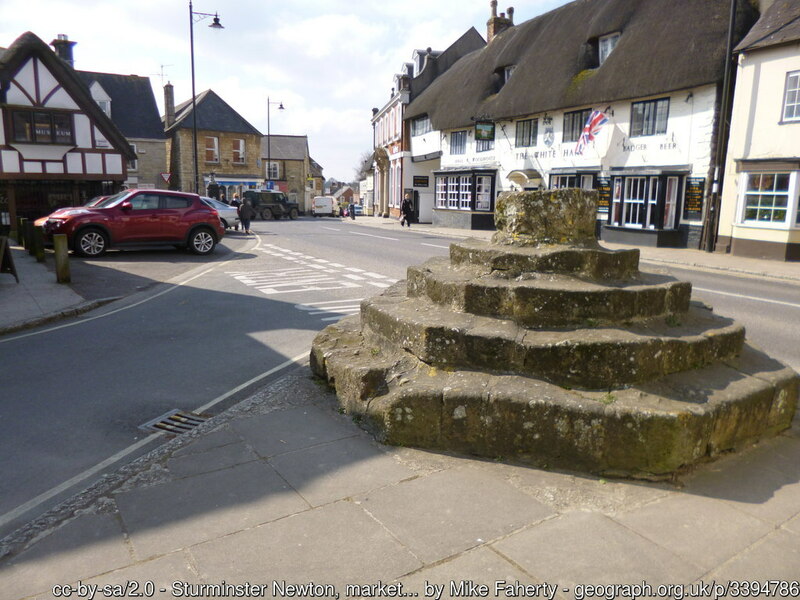 The monument was in part damaged in 1540 leaving four steps. The town continues its popular annual Cheese Festival. In the Market Place is the C17th Grade II Listed Market House. It has 2 floors and irregular windows. The present building sits on the site of the Old Market House, and parts of this may remain here. Parish church looking at the west porch and tower. St Mary’s Church is close to the High Street and is well worth a visit to see its C14th wagon roof which has 14 carved flying angels. The Grade I Listed, perpendicular-style church dates from the C14th, but with a C15th clerestory and some later additions and improvements. 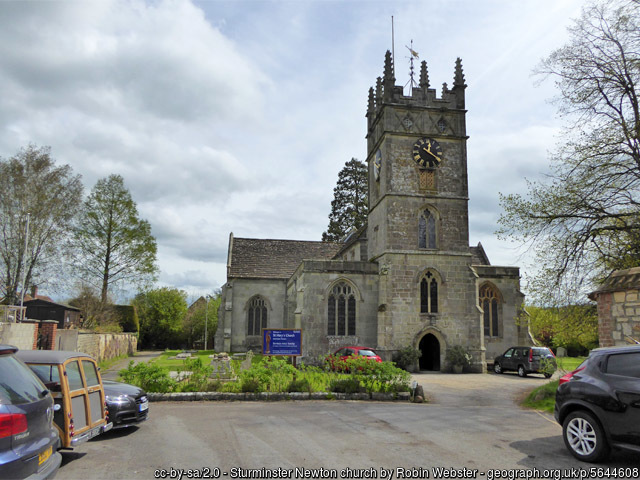 The tower has three stages and the clock faces to the belfry windows are a C19th addition. There are some lovely C19th and C20th stained glass windows. Across the Stour, near to the Mill, is a Grade I Listed six-arch C15th bridge which was widened in 1820. There have been mills here since Anglo Saxon times. At the time of the Domesday Book, 1086, there were four. The Grade II Listed Mill is now fully operative and makes flour for the Mill shop. The Mill welcomes visitors and the ground floor has wheelchair access. The Museum, a C16th thatched building in the town centre. Its collections tell the story of the town and its surroundings, including the nearby Roman villa. The Museum has a working model of the town’s railway station. In the C19th the building was home to John Conway, clock and watchmaker. The Museum now houses an oak, long-case clock inscribed Conway Sturminster. Henry VIII gave the castle to Katherine Parr in 1543. It was a manor house rather than a defensive castle. It now lies in ruins. 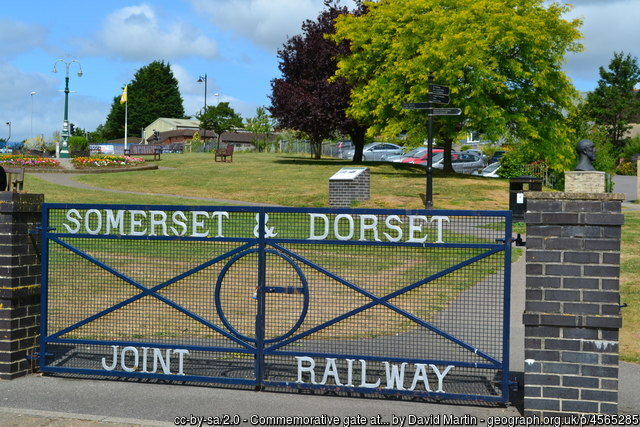 The Somerset and Dorset Railway served the town for over 100 years until the branch line closed in 1966. The railway Heritage Trust runs a Museum at Midsomer Norton. The novelist Thomas Hardy lived in the town from 1876 to 1878 following his marriage to Emma Gifford. In Sturminster, Hardy wrote Return of the Native.